Ruth Cadbury spoke in the Westminster Hall debate on safe standing, urging the Government to consider changing the rules to allow safe standing and by using Brentford FC as a pilot scheme. When the 2018/19 season kicks off in August, Brentford Football Club will be the only club in the Championship with standing terraces. In June 2018 the Club received special dispensation to continue standing terraces for another season given that it has started construction work on its new 17,250 seater stadium near Kew Bridge in west London. Brentford FC has more than 100 years’ experience of managing standing terraces and is fully supportive of the recent campaign to change the legislation to allow safe standing in controlled areas in all of the English Football Leagues (as it currently is in Scotland and in the lower leagues of English Football). “It is clear to us from our discussions with supporters that Brentford fans want the option to stand to watch their football. New stadiums, and even older grounds like Griffin Park, are now very safe places to attend matches. Safety is paramount whenever we hold a game, procedures are rigorous and all our staff are highly trained. 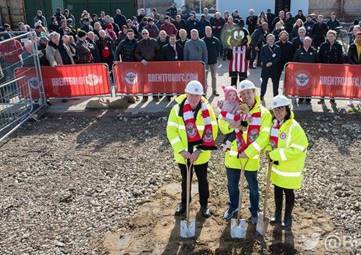 Ruth has supported the fans involvement at Brentford FC since she was a Councillor at Hounslow and encouraged by colleagues to grant the loan so the supporters could buy out Ron Noades’ share of the club.